The San Roque Multipurpose Project is the largest dam in the Philippines and one of the most controversial projects funded by Japan Bank for International Cooperation (JBIC) . Located on the lower Agno River of Pangasinan Province, in the Cordillera region of Luzon Island in the Philippines, thousands of indigenous people were displaced during its construction. Despite failure to comply with several Philippine laws and JBIC policies on indigenous people, and despite strong opposition from local communities, San Roque Multi-Purpose Dam, approved in 1998, became operational in May 2003. The structures, particularly San Roque Dam, were supposedly designed for four main objectives: electricity generation (345 megawatt capacity), irrigation of 87,000 hectares of land, reduction of floods which destroy crops during the rainy season [2,4,5,6,11]. The dam deprived the farmers of San Nicolas, Pangasinan of the Agno River’s overflow, which they had been taking advantage of for irrigation. Pangasinan was flooded in 2003 because of typhoon Chedeng, in 2004 because of typhoon Marce, and in 2009, because of typhoon Pepeng. The last one was responsible for inundating almost the entire province, destroying billions worth of crops and infrastructure and leaving 57 persons dead, due to the fact that San Roque dam had to dump excess water for several hours [6,12]. The land which became submerged was home to indigenous Ibaloi people. Around 2,500 Ibaloi farmers who worked fields on the dam site and gold panners who collected gold dust in the Agno river started an anti-dam movement in the mid-1990s. Jose Doton, who was then already a veteran activist, led the farmers of San Nicolas and other Pangasinan towns in opposing the San Roque Multipurpose Project, explaining that it would eventually inundate all the rice lands along the Agno River. The construction of what is now known as the San Roque Dam was completed in 2003. Doton fell prey to an extrajudicial killing on May 16 three years later – still in the thick of the campaign against the San Roque Dam, leading a group that was calling on the San Roque Power Corporation to compensate small-scale miners and others displaced by the project. A total of 780 households were forced to leave their homes because of the project. The dam also affected the lives of many people living in the upper basin, around the gate and in the lower basin . They complained of a violation of the Indigenous People’s Rights Act of the Philippines (IPRA), because of the implementing of the project without the indigenous people consent. Although the committee having jurisdiction over the IPRA finally admitted the construction as illegal, nothing changed. In the same way, the gold panners were not appropriately informed before the construction of the dam. After the construction started, they began to organize themselves into a federation to request proper compensation for the money that they had lost, and demanded substitute livelihoods . These local people have been organized as a movement of indigenous people under the Peasant Movement to Free the Agno River (TIMMAWA), while the Cordillera People´s Alliance has been at the forefront of the opposition against the San Roque dam since the start of the project. In 2006, Mr. Jose Doton, the leader of the TIMMAWA, was shot and killed in a political murder. After this affair, the anti-dam movement as well as some local NGOs became much weaker. Only a few outside NGOs, including Friends of Earth Japan, are now monitoring the resettled people’s situation [2,9,13]. Project Details The San Roque Dam has a height of 200 m above the existing river valley floor, and a reservoir of 850 million m2. It is a central clay-core rockfill dam with a compacted fill volume totalling nearly 40 million m3. The drainage area is 1,250 km2. It should generate 345 megawatt of electricity and irrigate 87,000 hectares of land [2,14]. Increase in Poverty in the area. In 2006, Jose Doton, or Apo (grandfather) was felled by an assassin’s bullets on May 16, a martyr in the people’s fight against the San Roque dam. 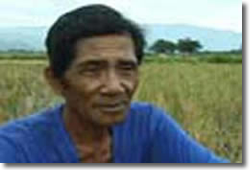 He was secretary general of the Pangasinan chapter of the Bagong Alyansang Makabayan (new patriotic alliance or Bayan) and chairperson of several organizations, among them the Tignay dagiti Mannalon a Mangwaya-waya ti Agno (Peasant Movement to Free the Agno River or Timmawa), San Nicolas Farmers Federation and San Nicolas Gold Panners Federation, Inc.
Why? Explain briefly. The committee having jurisdiction over the the Indigenous People’s Rights Act of the Philippines (IPRA) issued a final report admitting that the project had been implemented without the consent of the indigenous people. People affected by involuntary resettlement were allowed to choose between compensation in the form of cash or substitute housing. The SRPC introduced a livelihoods program for people affected by resettlement, but they were not a great success. Today, the lives of affected people are getting worse year by year. In Kamangan substitute community where 180 households settled after the project, around 50 households had to sell or rent out their houses because of poverty in 2010 . Rivers Watch East and Southeast Asia (RWESA), International Rivers Network and Friends of the Earth Japan (2003). Development disasters. Japanese Funded Dam Projects in Asia. Yu Terashima ()Dams in the Philippines and in Thailand: Social and Environmental Impacts of Natural Resources Development Projects. Multiple modernities: globalization in Asian context. Nile Basin Initiative (2008). Review of Hydropower Multipurpose Project Coordination Regimes. Best Practice Compendium. ECA Watch (2005). A Trojan Horse for Large Dams. How export credit agencies are offering new subsidies for destructive projects under the guise of environmental protection. Contributor Raquel Piñeiro Rebolo. Máster en Gestión Fluvial Sostenible y Gestión Integrada de Aguas, Asignatura ‘Ecología política y gestión de Aguas’.